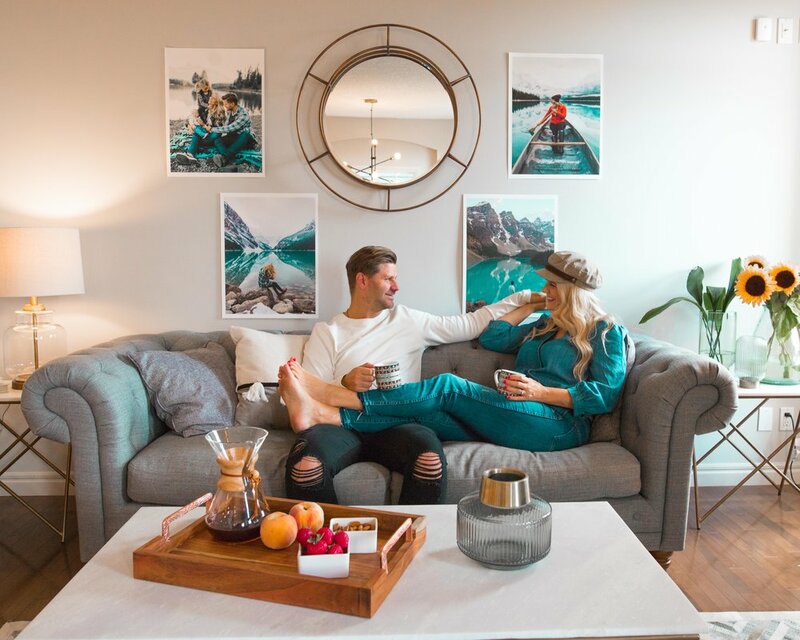 We recently purchased our first home and with all of the additional space quickly realised how much furniture we did not have to fill the spaces. Designing a new home can be overwhelming, working room by room is a lot less daunting (and easier on the budget!) so we decided to start with our living room. The living room is right off the kitchen, an area where the most time is spent; gathering together whether we are entertaining or just spending time as a family. For this reason, we wanted the space to reflect our style and be inviting for guests. When we were looking for a company to work with, our first choice was Structube. We were drawn to this company because of its large range, with beautifully designed pieces at a fraction of the cost of other retailers. It was our first experience with design but we were able to pull a lot of inspiration from Structube’s website, using the Inspiration tab. 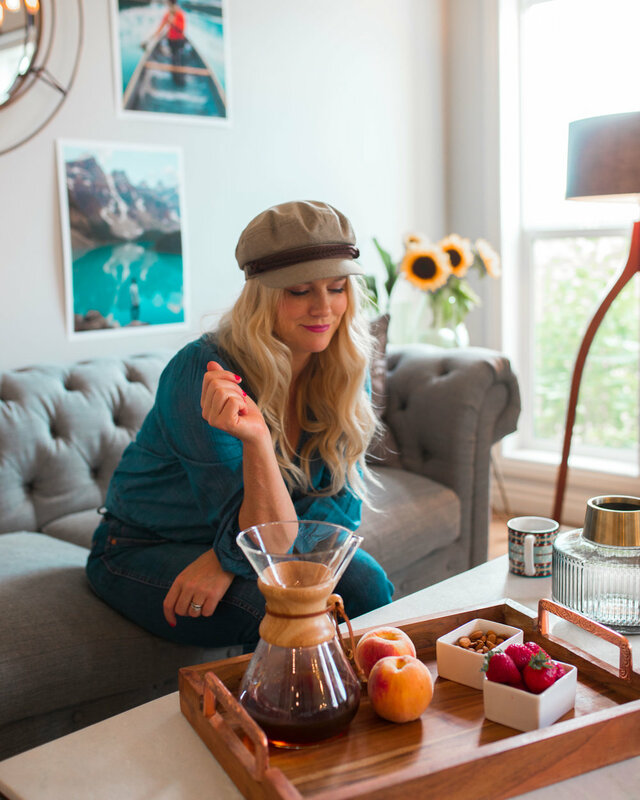 Under this feature there is four Room Tour options; the Living Room Room Tour has over 30 spaces each with its own theme exploring design solutions from Wit Whimsy & Originality to Industrial Bohemian Design The New Electric Trend and everything in between. We found this feature particularly helpful when trying to decide how different styles, fabrics, materials and colours can be used. We started with the couch as our initial selection to build around. From there, rather than adding a second sofa, we opted for two of the Kinsey leather armchairs. These armchairs are two of our favourite pieces, we love the bright colour of the leather and they are super comfortable. We added in the Kanji chair as a final seating option, its chic but also a little smaller and lighter so it can be moved around as needed when entertaining. For our coffee table we selected the Etta marble coffee table and Etta marble end table. We initially thought wood may offer a softer look to the room but we were able to pull inspiration from the Modernity of Inspired Geometrics room and really loved how they went with a white marble coffee table for this design. Lighting was a big finishing touch for the space. We selected the Bastille table lamp (which we love so much we just recently ordered two more for our bedroom nightstands), the Ella floor lamp, and the Itasca pendant light, which we placed above our fireplace. We were amazed at how just replacing the old lighting fixture with a new piece transformed the space alone. The final finishing touches were the Bonito mirror and the Agra rug. This rug is amazing, we love how it brightened the space and it also doesn’t show marks, which is very necessary with small children in the house. Lastly, we topped the space off with several vases and cushions from Structube accessories collection along with Masina ceramic lantern trio, which at $30 for all three is a total bargain. We love the selection of vases as well because we can constantly swap them around depending on what flowers or foliage we have. After completing a full living room make over, we would definitely say that spreading the budget across an entire room rather than spending the same amount on 1-2 high end pieces was a good fit for us. With children furniture takes a beating (Cruz has already knocked the Ella floor lamp over twice ha) and design preferences change. Spending a lot of a high-end piece that we may not necessarily love as much in 5years isn’t the right fit for us, which is why we love Structube so much. And now it’s got us putting together our wish lists for other rooms we want to make over….